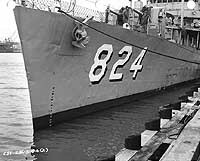 This page features most of the on board and close up views we have of USS Basilone (DD-824) during or after 1964. 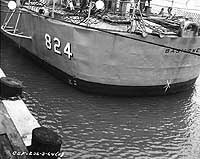 USS Basilone (DDE-824, later DD-824), 1949-1982. 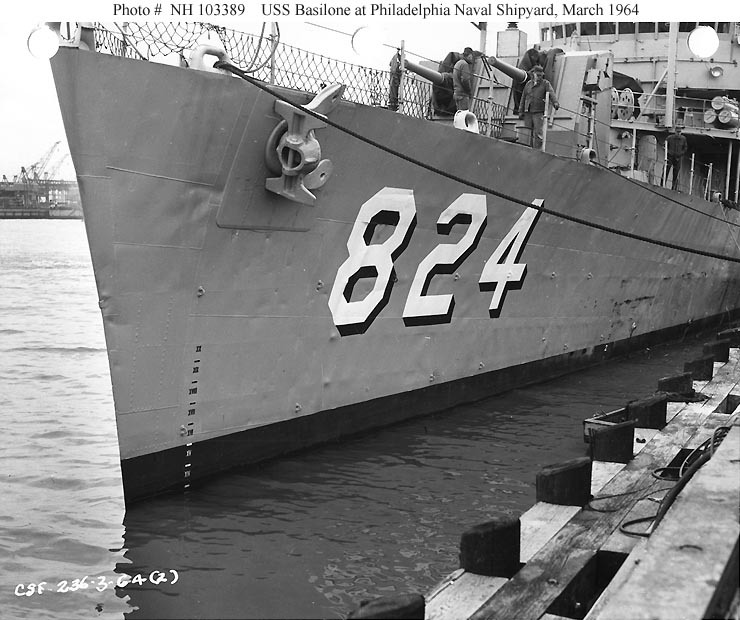 Closeup view of the ship's port bow, taken at the Philadelphia Naval Shipyard in March 1964, as the ship was completing her FRAM I conversion. 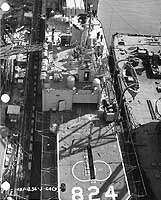 View looking forward over the ship's foredeck, taken at the Philadelphia Naval Shipyard in March 1964, as Basilone was completing her FRAM I conversion. 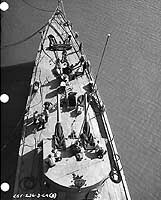 Note the tall antenna fitted atop the ship's forward 5"/38 twin gun mount. 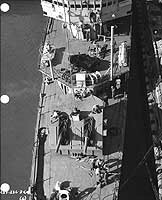 View looking aft from over the ship's foredeck, taken at the Philadelphia Naval Shipyard in March 1964, as Basilone was completing her FRAM I conversion. 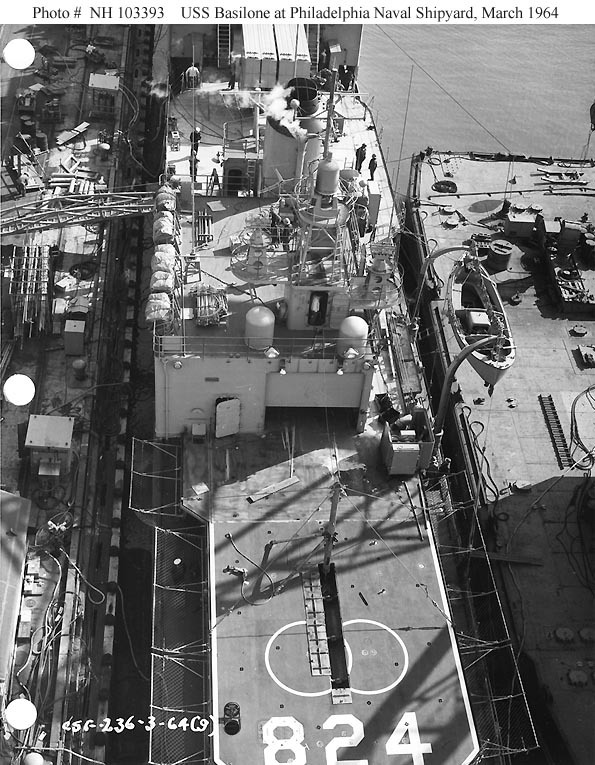 Note the underway replenishment fittings and Mark 32 triple torpedo tubes on the 01 level forward of the ship's newly fitted enclosed bridge. 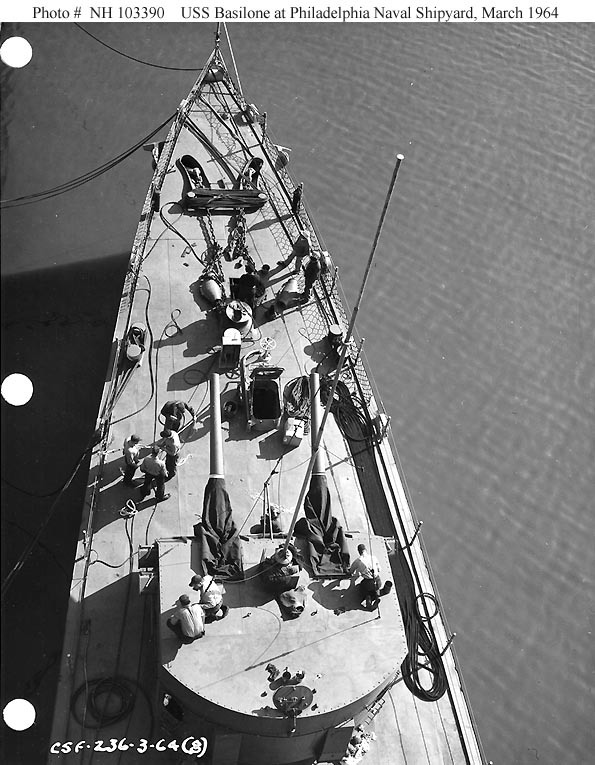 Note the ship's forward 5"/38 twin gun mount, topped by a tall antenna. 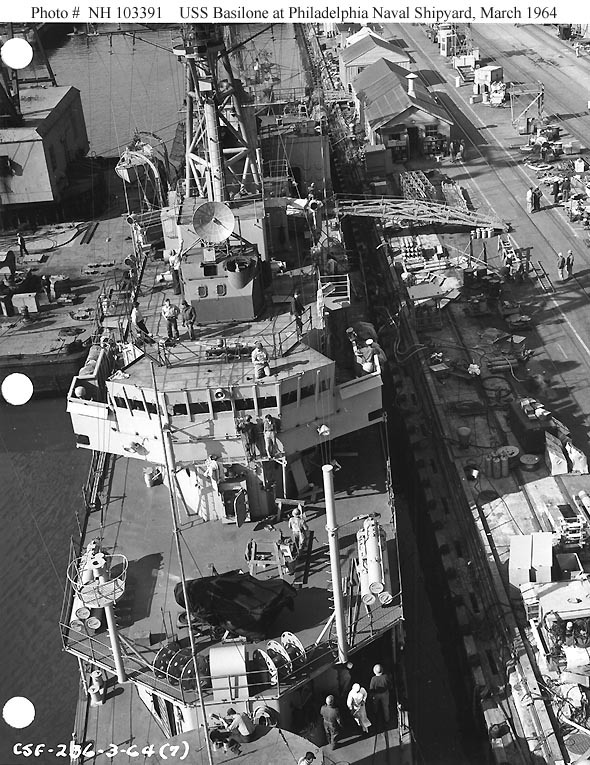 View looking forward from over the ship's afterdeck, taken at the Philadelphia Naval Shipyard in March 1964, as Basilone was completing her FRAM I conversion. 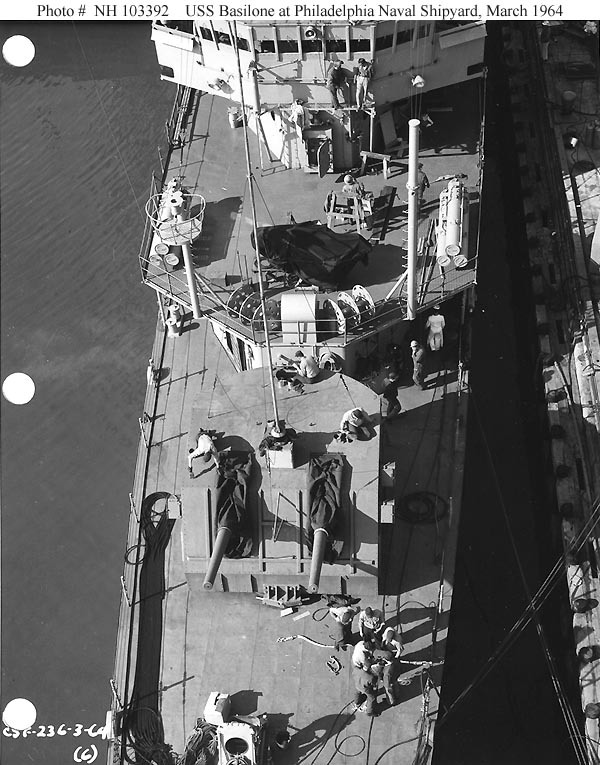 Note the ship's DASH drone helicopter flight deck and hangar, and her starboard whaleboat rigged out on its davits. 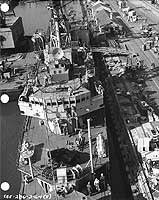 Closeup view of the ship's port quarter, taken at the Philadelphia Naval Shipyard in March 1964, as Basilone was completing her FRAM I conversion. 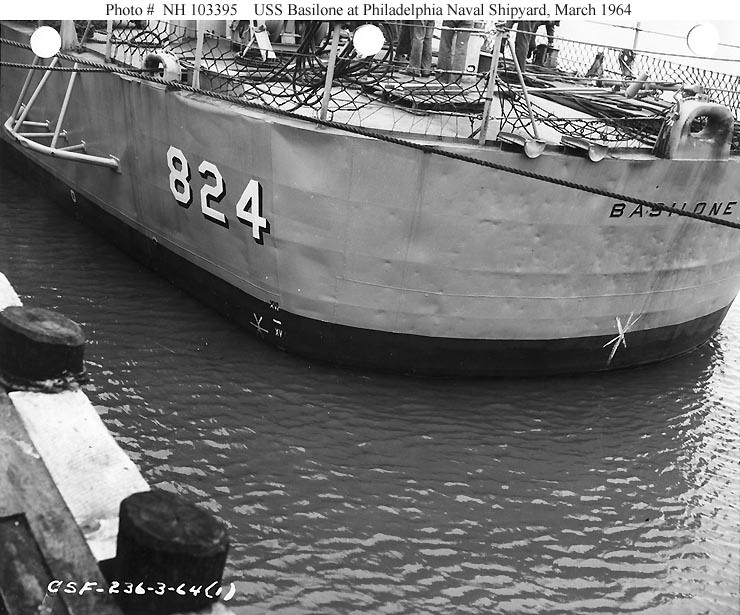 Note the ship's propeller guard, hull number, name, and dented hull plating. 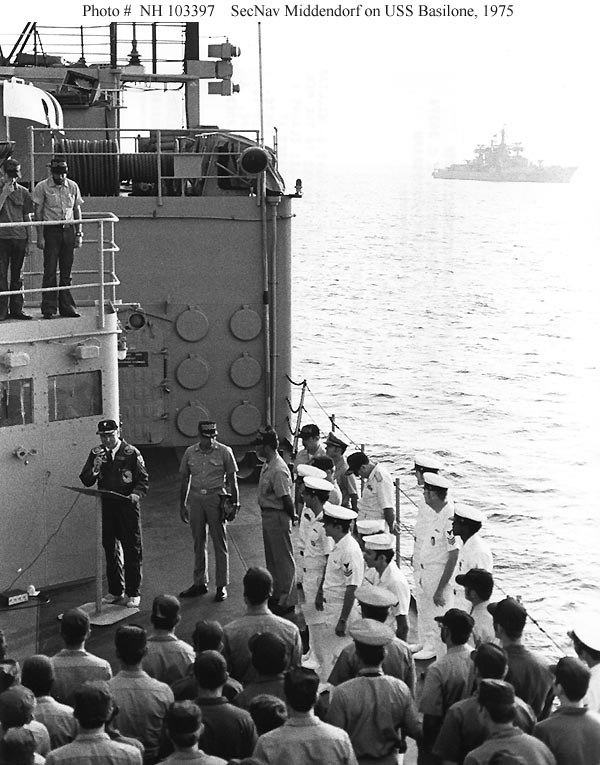 Speaks to the crew of USS Basilone (DD-824), as the ship operates at Kithira Anchorage near the island of Crete, 15 September 1975. 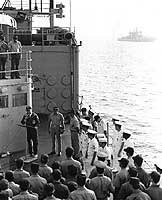 Mr. Middendorf is making a two-week visit to U.S. and Allied military units in Europe. A Soviet "Kresta" class guided missile ship is cruising in the right background. 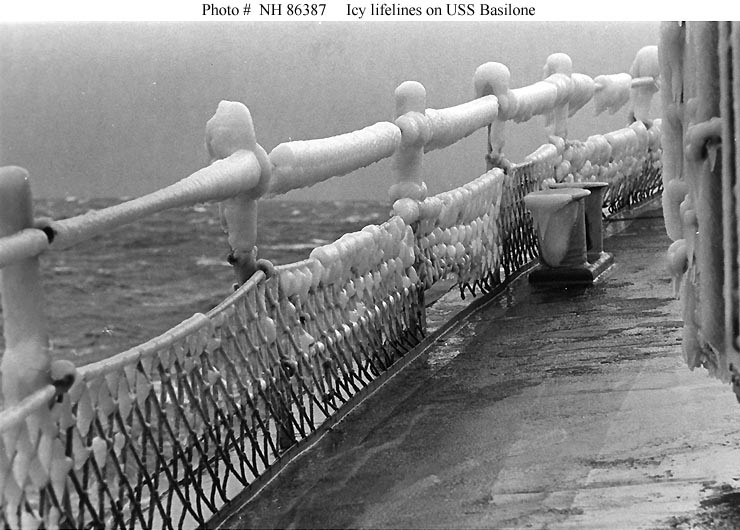 Ice formed on the ship's lifelines, during operations in the Atlantic Ocean during the mid-1970s.